Finally - finally! 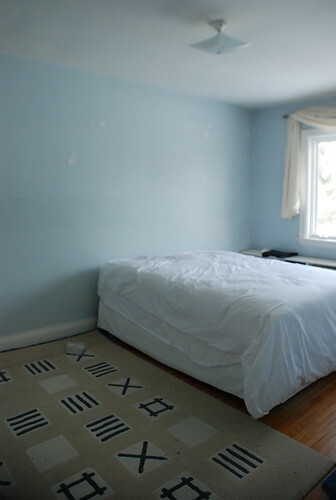 - we are starting on the nursery/guest bedroom this weekend. And not a moment too soon (clock is ticking 75 days and counting!). Today, my brother and dad helped HandyMan clear out the room and here's where we were at 11am. I know, not much to look at. It was a flurry of bookcases, bed linens, file cabinets, papers, shoes, clothes, rugs, dressers, baseboards, and dust bunnies (!) coming out of the room this morning. I can't wait to see what you come up with. I need inspiration to do our new baby's room. She's already 6 mos old, so I am really behind the ball! So exciting! And I know you guys will come up with something fantastic judging on all your previous work, can't wait to see! Hey isn't that was low and no VOC paints is for , shocking I am sure I painted my daughters rooms , but it was summer I guess that is out of the guestion , so put up your feet and relax . Did you get me email about S&C???? A clean slate is always good for a new beginning. We know it will be fabulous in the end.